Get all the seasonings you need to add zest to any dish. Serve up the best flavor while using the best ingredients. A well-stocked pantry is a necessity for anyone who likes to cook at home. Having everything you need at your fingertips allows you to create the tasty, wholesome meals that will keep your family from stopping at the drive-thru on the way home from work, school or elsewhere. It is a good idea to know what staples make up a properly stocked pantry, including the right spices and herbs, sauces and condiments. There are certain spices, herbs and seasonings no pantry should ever run low on. Some herbs like parsley, basil, oregano, cilantro and thyme are good to have fresh, either growing in your garden or indoor planter, or bought from a grocery store. But these have a limited shelf life and will go bad if not used within a few days of picking or purchasing. Dried herbs and spices, however, can last for up to a year when kept out of direct sunlight and in a cool, dry location. The must-have spices, herbs and seasoning for every kitchen include salt and black pepper, garlic powder, onion powder, dried oregano, dried basil, dried thyme, parsley flakes, dried rosemary, paprika, chili powder, bay leaves, cayenne pepper, crushed red pepper flakes, ground white pepper, ground cumin and curry powder. For baking, the items you should have include ground cinnamon, ground nutmeg, ground ginger, ground cloves, cream of tartar and vanilla extract. Other items that are nice to keep on hand include cinnamon sticks, vanilla beans, black peppercorns, kosher and sea salt, yellow mustard powder, wasabi powder, Cajun seasoning, Creole seasoning, ground allspice, Chinese five-spice powder, turmeric and coriander. Premixed seasonings like taco seasoning, fajita seasoning, poultry seasoning, steak seasoning and jerk seasoning are timesavers, but they sometimes have additives like monosodium glutamate that negate their usefulness. You would be better off making your seasoning batches and storing them in tightly sealed containers. 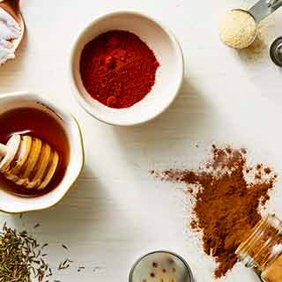 In addition to spices and seasonings, marinades and sauces are good items to have at your disposal to improve or add to the taste of your dishes, or even serve as bases for them. Certain cuts of beef are tough or have less inherent flavor than other cuts do, so marinating them for a few hours before cooking helps break down the muscle fibers and add flavor, making for tender, juicy, tasty meats. Although there are bottled marinades that do the trick, you can also make your own marinades using items like Worcestershire sauce, soy sauce, teriyaki sauce and more, combined with spices, seasonings and oil. It is a good idea to have some sauces handy in case you need to whip up a hearty meal at a moment's notice. Although homemade tomato and pasta sauce is ideal, there are many jarred and canned sauces out there that taste just as good as homemade, especially if you add your own small touches to them, like a dash of dried oregano or basil or a spoonful of granulated sugar. Jarred Alfredo sauce and pasta creates a tasty meal in mere minutes. Anyone who loves to eat sandwiches, hot dogs and hamburgers knows that condiments are some of the most important additions you can have in your pantry and refrigerator. The basic staples are ketchup, mustard and mayonnaise, but you don't have to settle for just plain when you can select condiments that will set you meals apart. For example, in the mustard category, yellow mustard may be king, but there are many contenders for the crown, including Dijon, whole-grain, honey-mustard, spicy brown and sweet hot. Ketchups are no longer a single-flavor option, either. There are ketchups that have sriracha sauce, jalapenos, onion, bacon and balsamic vinegar flavors added, too. There are also low-sugar, kosher, gluten-free, no-salt and organic versions available. For mayonnaise, there are those that are olive oil- and canola oil-based; light, reduced-fat and low-fat versions; and even some flavored with bacon, chipotle or sriracha sauce. Other important condiments to have on hand include pickles and pickle relish, jalapeno peppers, hot peppers, banana peppers, sun-dried tomatoes, roasted red peppers, salad dressings (which come in a multitude of flavors and are available in full-fat and low-fat versions), as well as tartar sauce, hot sauce and barbecue sauce. Barbecue sauces and hot sauces come in many different varieties and tastes, often dependent on the part of the United States you are from. Most barbecue sauces are tomato based, but some are mustard or vinegar based as well. Hot sauces can be mild to excruciatingly hot depending on how hot of a pepper is used for the sauce (based on its ranking on the Scoville scale). For example, jalapeno pepper-based sauces are going to be much milder than those that use habanero peppers or ghost peppers as the base. Be sure to read the labels to know what you are getting yourself into.